Professional 6-axes gyroscope fly air mouse & wireless keyboard & multimedia Android remote controller & Somatic games handgrip combo. Low power consumption 2.4G wireless connection with strong anti-disturbance ability and sensitive reaction speed. Plug and play USB 2.0 receiver, compatible with any device with USB port, including PC, TV, Set top box, game players, media players, etc. 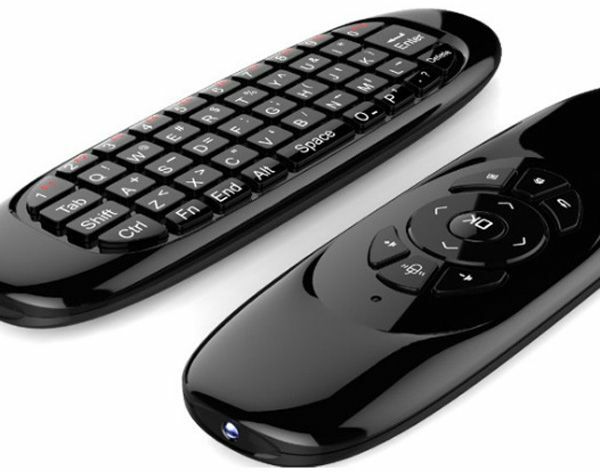 Free 360 degree omnidirectional remote control in the air or on other interface. Anti-shake algorithm air mouse, providing high accurate, extremely sensitive and stable control of the mouse cursor. Based on Gyroscope MEMS system, providing new style of MOUSE experience. Support Windows, Mac os, Android, Linux operating systems. Designed for PC, mini PC, some smart TVs, set-top boxes, network media players, game players, Android TV boxes, projectors, etc. Mini, handheld, lightweight and portable. 85.7% of users recommend this product to a friend. A lot like a magic mote or a Wii mote, perfect for android TVs,well made, cheaper than other alternatives, definitely worth the money. Responsive,good battery life, works with anything with a USB port, lots of function buttons, good range, light. Keyboard buttons are a little stiff and small to press.